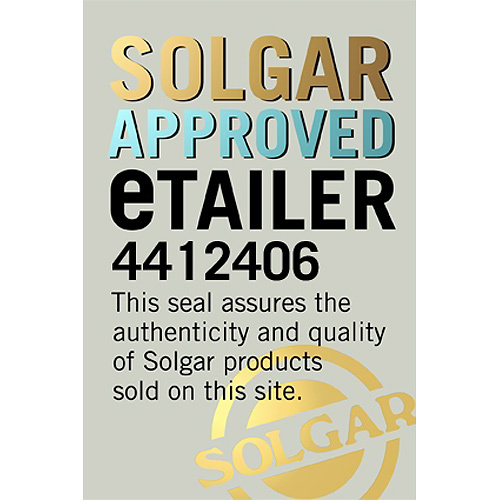 In stock -This product will ship today if ordered within the next 14 hours and 10 minutes. 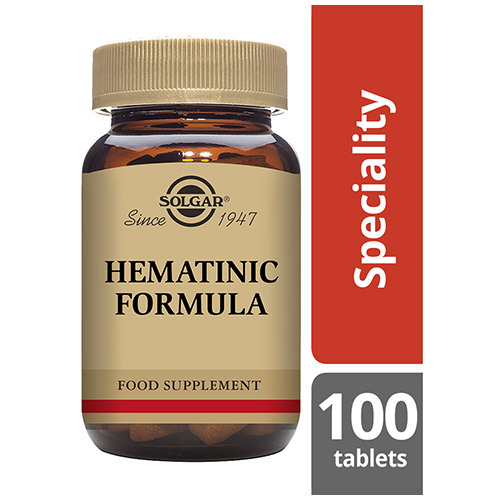 The special Solgar® Hematinic Formula is a combination of vitamins and minerals which all support the formation of red blood cells and the circulatory system. 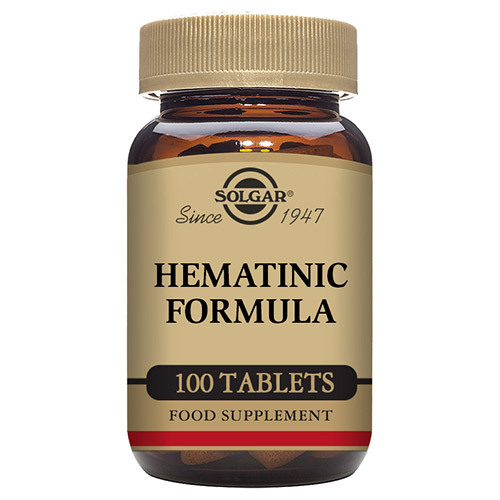 This potent product contains iron, liver, vitamin B12, folic acid and vitamin C.
Liver is naturally very high in nutrients such as iron, vitamin A, vitamin B and magnesium. It comes in a desiccated and defatted form for this formula. Iron is a key mineral and essential nutrient, required by the body for many different biological functions. Getting enough iron has been shown to reduce tiredness and fatigue and support healthy energy levels. Iron also helps carry oxygen around the body to our active cells and tissues. The unique form of chelated iron (iron bisglycinate) is formulated for enhanced absorption and is gentle on your system. Folic acid is a high strength B vitamin and contributes to several processes within the body, with the most well-known one its support of maternal tissue growth during pregnancy. 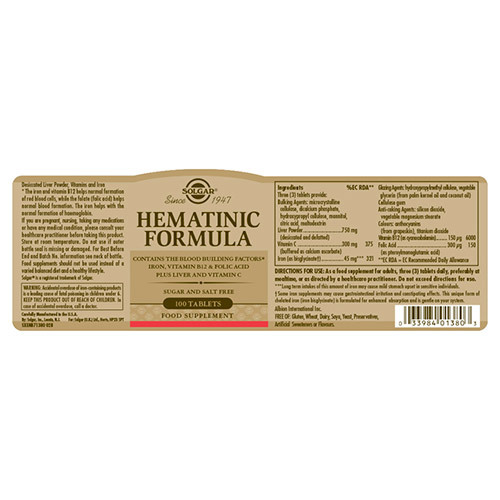 It helps normal blood formation and regulates healthy homocysteine levels and contributes to energy levels and general wellbeing. Also contains: Bulking Agent: microcrystalline cellulose, dicalcium phosphate, hydroxpropyl cellulose, mannitol, citric acid, maltodextrin. Glazing Agent: hypromellose cellulose, Cellulose Gum, Anti caking Agents: silicon dioxide, vegetable magnesium stearate, vegetable glycerin (from palm kernel oil and coconut oil), colour: anthocyanins (from grapeskin), titanium dioxide. 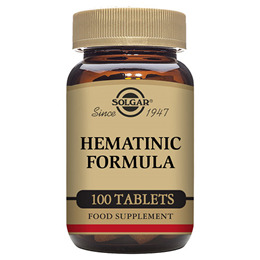 Below are reviews of Solgar Hematinic - Iron and Vitamins - 100 Tablets by bodykind customers. If you have tried this product we'd love to hear what you think so please leave a review. A gentle and highly effective iron supplement.